Overview of the Lilliput Sewage & Wastewater Treatment Process. Sewage is first sent to a septic tank where it is pre-digested. If you have the full Lilliput system (which eliminates the need for a septic tank), the raw sewage is sent to Lilliput® tanks where it is pre-digested by anaerobic bacteria, this converts the majority of the organic matter into simple chemicals. When there is an excess of flow, the sewage or wastewater is sent back to the septic tank which ensures proper, full treatment of the effluent. If you want to use the treated or processed water for anything other than irrigation, then a clarifier would be used to further treat the discharge by removing remaining solids and returning them to the septic tank. Finally the discharge is disinfected, this ensures that pathogens are removed from the water. Technical Description of the Lilliput Treatment Process. Wastewater needs to be pre-treated (pre-digested) in an anaerobic environment which is most commonly a Septic Tank. With a Full Lilliput® System, a Septic Tank is not needed as Surface Tanks are / can be used instead. Microbial digestion occurs here converting complex organic compounds to simple and importantly soluble organic compounds. The Bio-Reactor contains AWW MARK 2 fixed-growth media which is anchor for the bacteria to grow/ live on. The media is specially designed for maximum surface areas and voids. Under the media is a special air diffuser in the form of a membrane, this supplies oxygen to the system through fine bubbles. Nitrification and Carbonaceous degradation occur within the biofilm adhering to the media. 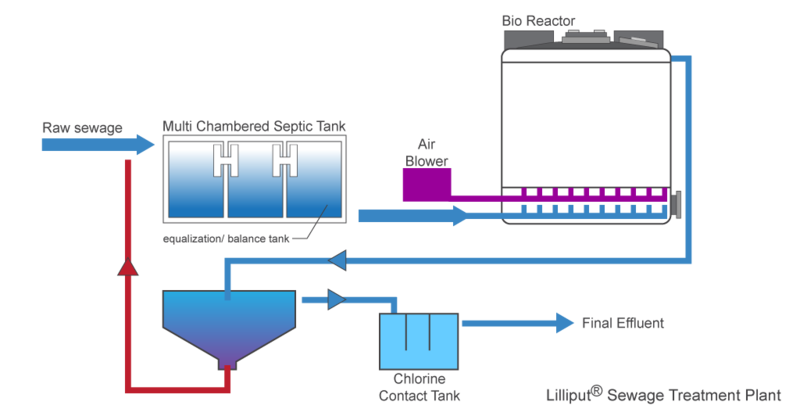 The biomass (fixed film) allows for chemical shock tolerance and regenerative capabilities, this is not achievable in activated sludge systems. After the Bio-Reactor, the resulting solution is sent to final cleaning. A Clarifier can extract fine humus particles before final disinfection takes place in the Chlorine Contact Tank. The Lilliput® final output (treated effluent) may be used for many purposes including irrigation, water features, car washing etc. Otherwise it can be released to water courses, dams, lakes or stormwater systems. The final out put more then satisfies limits for discharge to the environment. See output and results for more information.